Review written by and copyright: Eric Cotenas (14th April 2019). Geophysicist Commander Alan Roberts (The Glory Stompers' Jock Mahoney) is leading an Antarctic naval expedition beyond the Ross Ice Shelf to map and study the warm water oases first observed during the 1947 Richard Byrd expedition known as Operation Highjump. Traveling among the expeditions eight hundred men will be one woman: Oceanic Press journalist and photographer Margaret Hathaway (World Without End's Shawn Smith) who assures Captain Burnham (Dark Passage's Douglas Kennedy) that she can acquit herself quite well in such a situation. The expedition falls behind while plowing through seven hundre miles of ice – which will become impenetrable come winter just a few months away – and the first helicopter survey with Roberts, Hathaway, pilot Lieutenant Jack Carmen (All That Heaven Allows' William Reynolds), and mechanic Steve Miller (The Deadly Mantis' Phil Harvey) is soon ordered by Burnham to turn back when a storm appears on the radar. Carmen is ordered to try to skirt the storm rather than flying through it but that proves impossible and he attempts to maneuver through a break in the clouds only to collide with an unidentifiable flying object that causes them to descend through a thick cloud cover. As their gages show that they are going below sea level and the temperature starts to climb, they surmise that they must be descending into a volcano; however, they instead crash land into what Roberts surmises is a jungle unchanged since the Mesozoic era, its climate protected and unaltered by the thick cloud cover created by melting ice caps. They soon discover that prehistoric life still exists when they catch site of battling giant lizards, a dead pterodactyl, and most terrifyingly, a tyrannosaurus rex only scared away from them when it walks into the path of the spinning helicopter blades and is injured. Although Roberts insists that no human life existed during the Mesozoic period, the group discovers that their food supply has been raided, including tins opened up with a can opener. While Carmen and Miller attempt to fix the helicopter and the radio aerial, Roberts and Hathaway explore the terrain and get split up whereupon Hathaway strays into the path of a dinosaur and is carried away unconscious by persons unknown. Discovering human footprints, Roberts, Carmen, and Miller follow the tracks which end at the water where they discover on the other side a cave inhabited by Dr. Carl Hunter (Assault on Precinct 13's Henry Brandon), the last remaining survivor of a three-man plane expedition that went missing during the Byrd expedition. Alone for ten years, Hunter has become as bestial as the creatures he claims he controls by smashing their eggs and scaring them away with a horn fashioned out of a giant shell. He offers to tell the men where they can find the remains of the plane crash to salvage for parts to repair the helicopter, but only if they leave the woman behind. Roberts refuses but Hunter knows he can bide his time, especially come winter. In the ensuing days, first Miller and then Carmen start to resent Hathaway for refusing to stay with Hunter, but Roberts stands upon his principles – and his growing attraction to Hathaway – even refusing to get the location of the plane with torture when Miller gets the upper hand over Hunter. Hathaway decides to make a sacrifice for the survival of the others, but the hungry beasts of The Land Unknown intervene in the human drama. The last but not the least of the Universal's fifties sci-fi boom from producer William Alland (The Creature of the Black Lagoon), The Land Unknown is an entertaining sci-fi cheapie stripped down from what was intended to be an all-star, Eastmancolor feature – see the commentary for details – essentially rehashing elements of the earlier films into a new scenario. Like The Deadly Mantis, the sole woman in an expedition of men raises eyes and pulses but similarly dispenses with the possibilities of a love triangle – unless one posits Hunter as a nonconsensual third point – novelty beasties including a carnivorous tentacled plant that cops a feel and a lake-lurking Elasmosaurus – and the film's diversions prove sufficient enough to put up with the film's weaknesses. Alland's insistence on using stock footage as a cost-cutting measure starting with The Mole People is painfully apparent here starting with footage from the Byrd expedition while the effects are scarcely improved over what one would have seen in the 1940 Hal Roach production of One Million B.C. including scale shots of the actors and back projected lizards, poor shots of a silhouetted helicopter model dangled in front of background plates and projections, and the silliest man-in-a-suit tyrannosaurus rex to appear in a studio picture. The plotting also seems squeamish in being too quick to forgive characters who simply show regret and remorse for ruthless decisions that would have qualified them for dinosaur chow in any other film. Director Virgil Vogel was a Universal editor who cut Alland's This Island Earth which lead to the opportunity to direct with The Mole People – along with screenwriter László Görög whose subsequent feature credit amidst plenty of television credits would be Bert I. Gordon's Earth vs. the Spider – and, like a number of directors for the studio who got their start in the latter half of the fifties, he would end up consigned to episodic television from the sixties to his final credit with an episode of One West Waikiki that aired five months after his death in 1996. Released by Universal-International in 1957 and reissued by Universal Pictures in 1964, The Land Unknown received regular television play like the other Alland fifties titles but was oddly not given the Mystery Science Theater 3000 treatment despite seeming like a prime candidate. The film was released to VHS in 1994 and to DVD in 2007 as part of the The Classic Sci-Fi Ultimate Collection Volume 2 (which was repackaged with the first volume the following year as The Classic Sci-Fi Ultimate Collection Volumes 1& 2), and then a solo DVD-R edition as part of the Universal Vault Series line in 2013. The film's Blu-ray debut came from Germany's i-catcher Media in 2014 followed by a dual-format edition in the UK from 101 Films in 2017. Kino Lorber's 1080p24 MPEG-4 AVC 2.35:1 widescreen Blu-ray is derived from the same older master which seems to suffer from the limitations of the production more so than Universal's handling of their DVD-bound HD materials. The mismatching stock footage is more apparent here – unlike The Mole People, however, the significantly grainier color footage converted to black and white is restricted mainly to a film-within-the-film matted onto a project screen rather than being blown up here to Cinemascope, and back projection shots of the helicopter do not hold up well, while the obviousness now of the painted backdrops might actually be a plus for connoisseurs of special effects. Contrasts, on the other hand, are superior to the DVD transfer while edge enhancement is slight even when the image is zoomed in. The English DTS-HD Master Audio 2.0 mono track is of the studio's standard, with clean dialogue, effects, and music (the better to appreciate the studio's other cost-cutting measure of employing stock music from their own library). Optional English SDH subtitles are included. The film is accompanied by a new audio commentary by film historians Tom Weaver and David Schecter who traces the production from its origins as an aborted production by Charles Palmer (Reaching for Heaven) that eventually wound up with Universal and was initially conceived and announced as an Eastmancolor feature to be directed by Jack Arnold (Tarantula) featuring an all-star cast that was repeatedly scaled down and the idea of shooting in Eastmancolor discarded; whereupon, Arnold lost interest and it was handed over to Alland who did not want to do the production. 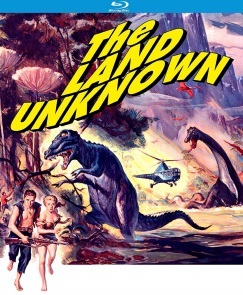 Weaver notes that although Alland was looking for cost-cutting measures on his productions including stock footage, he thought director Vogel's economical choices hurt The Mole People but felt they could only help The Land Unknown which had already spend most of its budget on the film's effects (with Alland calling the tyrannosaurus rex an "embarrassment"). Weaver also provides a synopsis of a Universal synopsis of the acquired Palmer script and the differences, combining the elderly commander and the geophysicist into one character and discarding the love triangle between the brainy scientist and the brawny pilot over the commander's daughter. Schecter of the label Monstrous Movie Music appears briefly to discuss the various sources of Universal stock music in the score, and there are also some distracting vocal reenactments of lengthier quotations from Weaver's interviews and other quoted sources. The disc also includes an animated image gallery, the film's theatrical trailer, and trailers for six other Kino Lorber sci-fi titles.